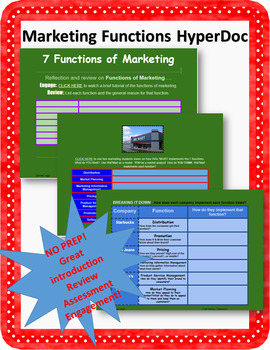 Marketing Functions NO PREP HyperDoc! NO PREPARATION! This is a great resource for introducing OR reviewing at the end of the term in a marketing class. This product has three sections. The second section is a study on how Wal Mart implements each of the 7 steps of marketing. Students watch an example and then the student acts as a "marketing analyst" and completes their own study of Wal Mart. The third section lists a variety of companies and functions and asks the student to give an example of how that company might implement that function to market. Great critical thinking activity...excellent source of review or introduction...using 21st Century strategies.